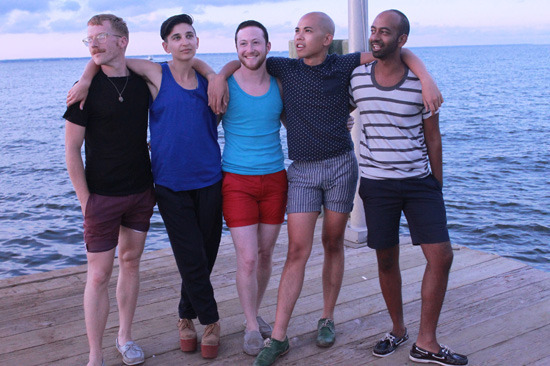 Mission: Fire Island Artist Residency (FIAR) is an organization founded in 2011 that seeks to bring the best gay, lesbian, bisexual, and transgendered emerging contemporary artists to Fire Island, a place long-steeped in GLBT history, to create, commune, and contribute to the location’s rich artistic history. FIAR will offer live/work spaces for selected artists who will participate in a summer residency while immersed in the Fire Island community. FIAR is dedicated to artists engaged in contemporary creative practices. Leading innovators in contemporary art serve as mentors, living alongside participants and providing them with one-on-one studio visits. These guests also share their experiences with the community through intimate and public lectures and salons. In this way, FIAR hopes to bring both new creative perspectives and prestigious art professionals together in this extraordinary location to foster the creation — and preservation — of queerness in contemporary art. Located off the south shore of Long Island, a few hours travel from New York City, Fire Island is the home of two historically prominent LGBT communities, Cherry Grove and The Pines. The older of the two, and the home of FIAR, Cherry Grove has evolved from a bohemian theater retreat in the early 1900s to a thriving resort for the LGBT community at large. Fire Island is the birthplace and inspiration for countless works of art, literature, choreography, and music, and has been host to queer visionaries like Robert Mapplethorpe, Frank O’Hara, Tennessee Williams, W.H. Auden, Edmund White and countless others. Throughout their many changes, Cherry Grove and the Pines have preserved the integrity of the dunes and beaches that have defined this intimate, remote location. There are no roads on Fire Island; raised wooden walkways and footpaths provide a network of paths from homes to beaches to tiny enclaves of shops, restaurants, hotels and bars. Miles of clothing optional beaches and historic woods provide places to explore the richness of this setting and make for exciting places to unwind, and the bars, town centers, and community halls provide plenty of options for meeting locals and visitors from the city. Demographic: National artists. Emerging LGBT/QUEER artists working in contemporary art. Benefits: In addition to our five residents, FIAR is host to many exciting visitors. Leading figures in contemporary art serve as mentors, providing residents with one-on-one studio visits and support. These visiting artists also share their experiences with the community through public lectures and discussions at the Cherry Grove Fire Department. In this way, FIAR hopes to bring both new creative perspectives and prestigious art professionals together in this extraordinary location to foster the creation — and preservation — of queer art-making in contemporary art. Posted in Fire Island Artist Residency (FIAR), New York, UncategorizedTagged American, Art, art residency, Artist, Artist Residency, arts, Collaborative, Communal, Contemporary Art, Contermporary Art, Drawing, Fellowship, FIAR, Film, Fire Island, Fire Island Artist Residency, GLBT, Installation, LGBT, LGBT Community, New York, Painting, performance art, Photography, Queerness, Rate My Artist Residency, Sculpture, Site-specific, Social Practice, Stipend, Studio, Summer residency, United States, video art, visual artist, workspaceBookmark the permalink.